Paul Gauguin Cruises is offering the six-star m/s Paul Gauguin for Tahiti cruises in 2018, 2019 and 2020. The Paul Gauguin was purposely built to cruise French Polynesia and offers cruises to Tahiti and the South Pacific year-round! Exclusive Offer: Up To $2000 USD Shipboard Spending Money! At the turn of the century, impressionist Paul Gauguin travelled to the tropical shores of French Polynesia to create some of his most renowned masterpieces! Today his namesake, the m/s Paul Gauguin ship, transports you into the same romantic vacation paradise - to escape, experience and explore Tahiti like no other! With the freedom to discover the exotic ports of the South Pacific onboard m/s Paul Gauguin, your every dream and expectation will be fulfilled in this unique part of the world! Your all-inclusive cruise fare on the Paul Gauguin includes everything from cuisine & beverages to the use of our exclusive, private beach and motu in Taha'a! With your gratuities included, a Tahitian cruise with Paul Gauguin brings all-inclusive to another level in Tahiti! Rest assured that however active or pampered you'd like to be while onboard the m/s Paul Gauguin, we can make it happen! The 217 staff, a luxury spa, the three restaurants, and your own watersports marina will make your stay onboard the Paul Gauguin everything you want it to be... and more! NOW AVAILABLE!! Paul Gauguin Cruises 2020 Tahiti Cruise Schedule! Nestled among the cool Pacific waters, Polynesian settlers found a string of fruitful and fertile emerald islands, carpeted with lush rain forests. Scattered over a vast, 2.5 million square kilometer area in the South Pacific, French Polynesia is made up of a series of islands, atolls, and archipelagoes! Each of these islands are surrounded by lagoons and barrier reefs that create unique eco-systems full of vibrant life and divine respites for the weary traveler. The m/s Paul Gauguin let's you choose from 7, 10, 11 or 14 night Tahiti cruise vacations. All cruises sail roundtrip from Papeete, Tahiti. Papeete is also where you'll find French Polynesia's only International Airport. Tahiti is just an 8 hour flight from Los Angeles, California... Paradise is closer than you think! Spend a complimentary day on our private island, Motu Mahana, located off the coast of Taha'a. Motu Mahana features: swimming, snorkeling, watersports, white sand beaches and a sumptuous barbecue feast with full bar service! The cuisine onboard the m/s Paul Gauguin may forever set the standard as the most sumptuous meals you've ever tasted! Throughout your dining experience, our attentive staff will discreetly ensure that your complimentary wine is perfectly paired and that you are surrounded with convivial company. Our chef will even cater to special requests, with delicious vegetarian and low-carb options available by request. From the moment you are greeted at L'Etoile restaurant, you know you're in for an exquisite dining experience. Open for dinner only, our elegant main dining room surrounds you with a perfectly appointed decor, crisp linens, and an array of tempting specialties, expertly prepared. La Veranda restaurant offers floor-to-ceiling windows, indoor and al fresco seating, and a refined atmosphere that makes it the perfect place to enjoy buffet breakfast or lunch. Le Veranda often features international themes and an a la carte menu is also available. The culinary creations of Jean-Pierre Vigato, Chef Proprietaire of the world-renowned, Michelin-starred Restaurant Apicius in Paris, are featured in La Veranda. For a more casual dining experience, enjoy Le Grill. Greet the sun with a buffet breakfast, or enjoy lunch by the pool with a choice of grilled favourites, salads, and fresh tropical fruits. At night, make new friends at dinner, as you savor Polynesian specialties in a relaxed atmosphere on deck. Enjoy a refreshing dip in our onboard swimming pool, located under the sky on Deck 8. Or perhaps you'll simply relax poolside in a deck chair, with a good book and a beverage from the Pool Bar. Aboard m/s Paul Gauguin in Tahiti, you can also take advantage of our onboard SCUBA lessons. The m/s Paul Gauguin is the only luxury ship in French Polynesia to offer PADI certification on board for novice divers, as well as refresher courses. Watersports are a highlight of the Paul Gauguin Cruises' experience. Aboard m/s Paul Gauguin, a specially designed retractable watersports platform enables guests to descend to sea level, where they can conveniently hop aboard a windsurfer or paddleboard, launch a kayak, or set out for an optional SCUBA diving expedition. The Paul Gauguin's SCUBA diving excursions are designed for all levels of experience. The watersports marina is available in select ports and subject to weather conditions and local restrictions. The m/s Paul Gauguin is home to the Deep Nature Spa by Algotherm, an award-winning luxury spa. With its unrivaled approach to beauty and rejuvenation, the spa combines the art of gentle pampering with services that are tailored uniquely to the needs of each individual. Designed as a luxurious refuge from everyday stresses, our spa offers an extensive range of physical regimens, including health and revitalization. Shipboard treatments include skin-care therapies, skin exfoliating, massage, reflexology, aromatherapy, body wraps, facials, and beauty treatments. Relaxing overwater massages are also available on our private motu off the coast of Taha'a! Exercise your options in our Fitness Center complete with Lifecycles, treadmills, stairmasters, and weight machines. You won't need to forget your work-out routine when cruising Tahiti with Paul Gauguin. Every evening (except when prohibited by port regulations), you can try your luck in the newly expanded Le Casino. Enjoy slot machines, blackjack and stud poker. Or just relax with a drink at the Piano Bar, enjoying live entertainment. Watch spectacular performances every evening. Enjoy an electrifying Polynesian show featuring the arts of the islands in the main lounge by our beloved troupe of entertainers, Les Gauguines. One night it might be the soaring acappella harmonies of himene songs. Another show might feature a guest Polynesian troupe offering a thrilling performance of ote'a - a complex line dance accompanied by drums telling the ancestral legends of the Polynesian people. On other nights, you might marvel at the skill of a pianist... tap your foot to a rock band... or hum along to familiar tunes performed by a veteran of Broadway. Our selection of entertainment on board is sure to make every evening a pleasure! Built specifically to sail the waters of Tahiti and French Polynesia, the 332 guest m/s Paul Gauguin offers you relaxed luxury and superb service! With one of the best crew-to-guest ratios at sea, 1 to 1.5, you will feel pampered and catered to - as much or as little as you prefer! Completely updated in 2012, all suites and staterooms feature ocean views, with nearly 70% of staterooms including private balconies! Renovations throughout the Paul Gauguin included: new flooring and carpeting, elegant new furniture, new window treatments, and decorative wall panels! All suites and staterooms feature a new refreshed look: new mattresses, new fabrics, teak railings on the balcony and teak flooring in the bathroom! La Veranda and Le Grill restaurants were both redesigned with new decor for your dining pleasure! While onboard the m/s Paul Gauguin, you can always find a little something to pique your interest. From specially designed lectures, to heart-pounding casino action, your Tahiti cruise adventure is not limited to your time ashore! Whether you spend the day kayaking at sea, hiking through the wilds of French Polynesia, or reading under the Tahitian sun... as your day comes to a close, you'll feel at home within the intimate splendor of the m/s Paul Gauguin! Cradling you in comfort the spacious, five star staterooms will welcome you home after a long day of discovery and exploration! After a restful night of slumber dreaming of your adventures, you will be fully prepared for another day full of excitement in French Polynesia! Staff of 217, for a crew to guest ratio of 1:1.5 - among the highest at sea! A New Program for Kids and Families, in Partnership with the Wildlife Conservation Society (WCS)! Paul Gauguin Cruises is offering a new way for families to explore the South Pacific together through a joint program with the Wildlife Conservation Society. WCS has been committed to saving wildlife and wild places for over 120 years. In addition to being among the world's leading science and conservation organizations, WCS manages the largest urban network of zoological parks, educating and inspiring millions of people at the New York Zoos and Aquarium. During the summer months and holiday season, Stewards of Nature: a WCS Partnership, is offered aboard the m/s Paul Gauguin and invites guests to discover and value nature through hands-on, interactive learning for children ages 7-17, as well as family members. Once aboard the m/s Paul Gauguin, WCS naturalists will gather with families and provide a program introduction and itinerary for the duration of the voyage. Every day, there will be a combination of island and beach excursions, science activities, crafts, games, and other adventures. While all of the items on the itinerary are included for kids through the nominal fee paid at booking, family members are invited and encouraged to participate in most activities for the additional cost of the shore excursions. Voted the #1 Small-Ship Cruise Line for Families by Travel + Leisure's World's Best awards for two years in a row!! Enjoy Paul Gauguin Cruises Private Paradise ... and Yours! Part of what makes a voyage with Paul Gauguin Cruises so special is the access our small ships provide to some of the world's most idyllic, unspoiled beaches. In Polynesia, two of those beaches are ours exclusively, and we are happy to share with you the opportunity to spend as much as a full day delighting in their pleasures. Those who enjoy watersports especially are in for a real treat at either of these options. Motu Mahana in Taha'a - Tucked away off the coast of Taha'a is Motu Mahana, Paul Gauguin Cruises' unique island retreat. Spend the day doing exactly what you'd like, whether that's enjoying a good book under the shade of a swaying palm, snorkeling in impossibly blue waters, engaging in a demonstration of Polynesian culture, such as the life of the coconut, or treating yourself to an overwater massage. When refreshments are in order, indulge in a sumptuous barbecue feast - complete with cocktails from our floating bar. White-Sand Beach In Bora Bora - During The Gauguin's port call on Bora Bora, spend as much time as you'd like on our exclusive beach on a motu off the coast. Enjoy beach volleyball, kayaking, paddle boarding, snorkeling, and postcard-perfect views of Mount Otemanu towering over the main island in this exclusive getaway. Extend Your Stay in Tahiti with an Overwater Bungalow! There are only a select few places in the world you can experience an Overwater Bungalow; the islands of French Polynesia is one of them! Paul Gauguin Cruises offers exclusive hotel packages before and after your Tahiti cruise. You can choose to stay 2, 3 or 4 nights in Bora Bora, Moorea, Tahiti or Rangiroa. 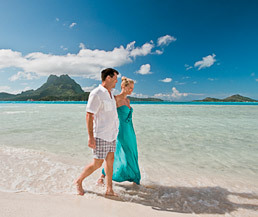 Enjoy an extended holiday, a Tahiti Cruisetour, with accommodations at one of the InterContinental Resorts! Enjoy your Tahiti Cruisetour for less than booking directly with the resorts! Click here to view our Tahiti Cruisetour packages now! Book your Tahiti cruise with Cruising2Tahiti.com a Pearls Accredited Partner with Paul Gauguin Cruises!